The purpose of this study is to characterise progesterone concentration in Bali cows before, during and after pregnancy. This study enables pregnant status to be detected shortly following conception in Bali cow. Five Bali cows and one Bali bull were used in this study, between June 2010 and September 2011. The concentration of progesterone in the blood serum was analysed using Enzyme-Linked Fluorescent Immunoassay principle in Enzyme Linked Immunosorbent Assay method. Cow bodyweight increased during pregnancy aligned with foetus development in uterus. The progesterone concentration in non-pregnant cow was 1.32 ± 0.93 ng/ml over 11 months of observation. For the pregnant cows the progesterone concentration was 0.76 ± 0.64 ng/ml before pregnant and increased pronouncedly ranging between 7.43 ± 5.27 and 16.7 ± 2.29 ng/ml from the first up to the 7th month of pregnancy, then slightly declined toward parturition, between 11.55 ± 0.71 and 8.46 ± 5.33 ng/ml, and plunged down markedly to level of 0.89 ± 0.24 ng/ml following parturition. Progesterone concentration were markedly different in pregnant versus non-pregnant Bali cows. This allows pregnant status of Bali cow to be detected shortly following conception. Copyright: © 2013 Astiti, L. G. S., & Panjaitan, T. Creative Commons Attribution 3.0 Unported License. Improving livestock productivity requires an increasing in the reproductive performance and the number of breeding cow to a certain level, in order to meet the demand of animal protein (Tagama, 1995). Increasing reproductive performance is a fundamental aspect in cattle reproduction (Tagama, 1995) to achieve one calf per cow per year. An understanding of the reproduction and pregnancy status of the cow is rather vital in breeding management and this is closely related to the reproductive cycles (Romano, 2011). Bali cattle is known for their adaptability to harsh environmental condition, with low quality feed, but still have a high fertility rate that give high production performance (Darmaja, 1980; Wiryosuhanto, 1996; Enwistle, 2001). The estrus cycle period in cows generally ranges from 18 to 24 days (Parish, 2010) and Bali cattle recorded 20 days for heifer and 21 days for cow (Pane, 1991; Wirdahayati, 1994). Estrus cycle consists of four phases, namely proestrus, estrus, metestrus and diestrus (Anonymous, 2011a). Progesterone is a hormone produced by the corpus luteum (Rekawiecki et al., 2008). Several studies have reported that progesterone concentration is correlated to corpus luteum size (Putro et al., 2008). However, it has been reported that no significant differences exist in progesterone concentration between breed (Jimenez et al., 1985; Diaz et al., 1986). This hormone is essential for preparation of the reproductive tract as the place to implant the embryo and the maintenance of the pregnancy (Hafez and Hafez, 2000; Romano, 2011; Anonymous, 2011b). When progesterone level in cow’s blood serum is less than 1 ng/ml, this indicates that the animal is in the luteal phase of the estrus cycle. In contrary, if its level is higher than 1 ng/ml, it shows that the animal is in the follicular phase (Ricoy et al., 2000). The objective of this study was to characterise progesterone concentration in Bali cows before, during and after pregnancy and to enable early pregnancy detection subsequent to conception in Bali cow. The study was carried out in the experimental station of the Assessment Institute of Agricultural Technology at Narmada (Latitude, 8° 35' 50, 21 S, Longitude, 116° 13' 08, 46 E, and elevation 148 m above sea level), West Nusa Tenggara, Indonesia, between June 2010 and September 2011. Five cows and one bull were used in this study. The females were given specific number for the ease of identification. Four females were mated with male and the other one was untreated (unmated) and referred as control. The selected bull fed with similar basal diets of mix forages such as elephant grass, setaria, mullato and rice straw, supplemented with rice bran 0.5% body weight. All animal received the same amount of feed. Salt and water were provided ad libitum throughout the day. All cattle were treated with albendazole and ivermectin, against internal and external parasites, prior to the commencement of the experiment. Following estrus, cow females were naturally mated with the bull. Blood samples were taken periodically every month prior and during pregnancy and one month subsequent to parturition. Body weight was monitored monthly. Blood (6ml) was obtained from the jugulars vein, using a 10ml syringe and transferred into a 10ml glass tube. Serum was separated by centrifugation at 3500 rpm for 10 minutes 3 times. The blood serum was then put into a numbered micro tube. Progesterone concentration in the serum was determined using Enzyme-Linked Fluorescent Immunoassay (ELFA) principal in Enzyme Linked Immunosorbent Assay (ELISA) method which has sensitivity close 100 times better than original ELISA (Yolken and Stopa, 1979). All data were tabulated and analysed descriptively using excel 2007 (Windows 7). The present study demonstrated characteristic of progesterone pattern in Bali cow (Figure 1). The progesterone concentration in the control animal was 0.98 ng/ml and was in close agreement with the rest of the cow prior to conception, which averaged 0.76 ± 0.64 ng/ml, varied from 0.29 to 3.04 ng/ml. This is also in agreement with Arimbawa et al. (2012) who reported progesterone concentration of 0.52 ng/ml by non-pregnant Bali cows. Low progesterone concentration (0.2 ng/ml) in non-pregnant Zebu cows has also been reported by Mukasa and Azage (1989). The low progesterone concentration found in this observation agrees closely to Zaora et al. (1982) who suggested that cow with progesterone level less than 2.4 ng/ml indicates that the cow is not pregnant. The variation on progesterone concentration within non pregnant dams indicated the different phase of estrus cycle between the animal. Ricoy et al. (2000) reported that when the level of progesterone in the blood is less than 1 ng/ml indicates that animal is in luteal phase of estrus cycle. However, according to Chung et al. (2012), slightly increase in progesterone concentration occurred up to day 18 of the cycle and then decreased to the lowest level approaching diestrus (Budiyanto, 2012). 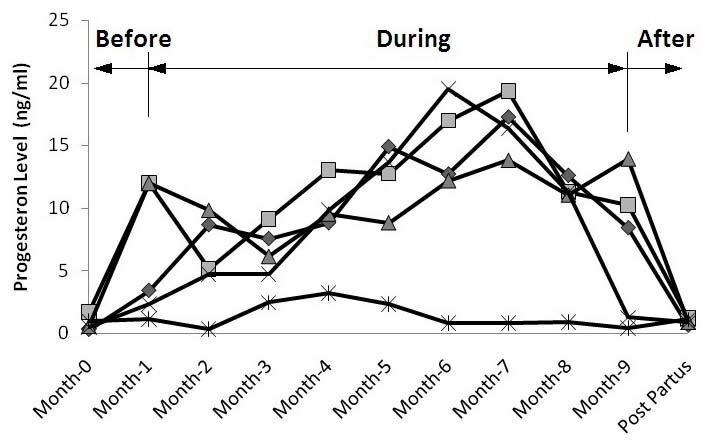 Belli and Jelantik (2011) confirmed this pattern in Bali cattle, where progesterone concentration began to rise on day 4 of the cycle (1.9 ng/ml) and increased to concentrations as high as 5.4 ng/ml during the luteal phase (day 12), before returning to basal levels i.e. 0.1 ng/ml. This is in agreement with Arimbawa et al. (2012) who reported the increasing of progesterone level in Bali cattle occurs on the 4th to 13th days after ovulation and could reached up to of 9.52 ng/ml on the 13th days. Similar pattern was found in Zebu cows (Mukasa and Azage,1989) and, similarly, Kayacik et al. (2005) reported that the progesterone level could reach 9.81 ng/ml on day 10 of the estrus cycle an decreased on diestrus phase ranged from 1.1 to 1.7 ng/ml. Decreasing progesterone concentration to the lowest level indicates that luteolysis or degradation of structural and functional corpus luteum occurs in the absence of pregnancy (Romano et al., 2011). It can be concluded that, when progesterone concentration in the serum of Bali cattle is considerably low (3.0 ng/ml), indicates that the cow is not pregnant. Figure 1: Progesterone levels in Bali cattle before, during and after pregnancy. The study showed that the average levels of progesterone in Bali cows during the period of 1st to 7th month of pregnancy ranged from 7.43 ± 5.27 to 16.7 ± 2.29 ng/ml. This high level of progesterone was produced by the corpus luteum to maintain the pregnancy (Mann and Lammning, 1999; Inskeep, 2004; Romano, 2011). If the pregnancy occurred, the corpus luteum sustains its progesterone level high until reaches of 13.9 ng/ml (Anonymous, 2012). Yanhong et al. (2004) reported that luteal cells increased significantly with development of corpus luteum, during the 5-8 week of pregnancy. However, the progesterone level obtained in this current study was higher than those reported by Belli et al. (2011), who found 5.46 ng/ml in 3 weeks of gestation and reaching a peak level of 10 ng/ml in 10 weeks of gestation. Differences of these results might be caused by difference of methods; where Belli and Jelantik (2011) used Radio Immuno Assay methods as Belli and Jelantik (2011), they also found that increasing feed quality has no significant effect on progesterone level in Bali cattle. At the 8th month of pregnancy, the number of progesterone hormone was averaged 11.55 ± 0.71 ng/ml. Whilst in the 9th month of pregnancy, its level had slowed down to an average of 8.46 ± 5.33 ng/ml. This declining level of progesterone started from 7th month of pregnancy up to a day before giving birth. The level of progesterone at the end of pregnancy period, 10 weeks pre calving in Bali cattle, reached 2.83 ng/ml (Belli and Jelantik, 2011). Jain et al. (1980) confirmed the decrease in progesterone levels in a day before giving birth. This occurrence was due to the hormonal changes, in which the endocrine system reduces the production of progesterone and generates more estrogens hormone that serves to increase the tonus of uterus, relax the cervix and escalate the sensitivity of uterine muscles toward oxytocins hormone (Toelihere, 1985). At the 1st month after giving birth, the average level of progesterone was close to the level before pregnancy, with the average of 0.89 ± 0.24 ng/ml. After giving birth the progesterone level is back to its normal conditions. This is in agreement with Mukasa and Azage (1989) who found that progesterone level in Zebu cow was 1.0 ng/ml one week after calving. From this phenomenon, it showed that following parturition the level of the progesterone would be back to its normal conditions and ready for the next estrus cycle. The low progesterone occurred due to negative feedback action on the hypothalamo‐hypophysis axis, allowing for recovery of gonadotropin function to block progesterone being produced (Belli and Jelantik, 2011). Progesterone concentration is high in pregnant animal and in Bali cow and can reach up to 17 ng/ml when the cow is in the 7 month of pregnancy. Cow bodyweight changed from early pregnancy (3rd month) to late pregnancy (9th month), and following parturition it showed similar pattern in all animals (Figure 2). The cow bodyweight increased during pregnancy in line with foetus development in the uterus and decreased subsequently following parturition. However, bodyweight tended to remain unchanged from 7 to 9 months of pregnancy due to change in diet composition; this was below the expectation, as this slightly affects body condition for most of the pregnant cows in this study. Figure 2: Bodyweight of Bali cow from early pregnancy, during pregnancy and following parturition. Bodyweight increase as the pregnant status proceeds indicates that the cow received sufficient nutrition to support foetus development. 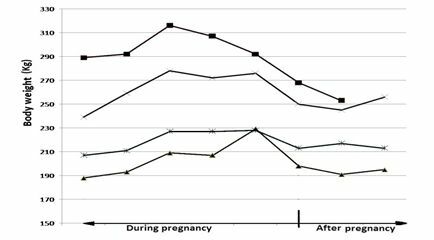 Although bodyweight remains unchanged and body condition seemed to decrease in the last trimester of the pregnancy, this did not affect progesterone concentration during the late pregnancy. The decrease in progesterone concentration from 7 to 9 months of pregnancy in the current study is in agreement with the previous study on Bos javanicus, Bos indicus and Bos Taurus (Adeyemo and Heath, 1980; Jimenez et al., 1985; Wirdahayati, 1994). This phenomenon is a negation to any effect of nutrition status, during last trimester of pregnancy, on the decrease of progesterone concentration over 7 months of pregnancy to parturition. Progesterone concentration in blood serum of Bali cows increased pronouncedly following conception and remains high during pregnancy, but slightly decreased two months prior to parturition then plunged to the lowest point following parturition to the non-pregnant level. The marked differences in progesterone concentration between pregnant and non-pregnant allow an early detection of pregnant status in Bali cow, and the level of progesterone during pregnancy may be used to estimate month of pregnancy. We are grateful to acknowledge Prof. Dr. Ismeth Inounu and Prof. Dr. Argono R. Setioko for proof-reading the manuscript and the contribution of the technical assistances with their help during the work. 1. Adeyemo, O. and E. Heath. (1980). Plasma progesterone and milk progesterone assay in pregnancy diagnosis in White Fulani (Zebu) cattle. Anim. Reproduction Sci. 19:205-208. 3. Progesterone and pregnancy: what you need to know. (2011). E-book. 5. Arimbawa, I.W.P., I.G.N.B. Trilaksana and C.G.O. Pemayun. (2012). Gambaran hormon progesteron sapi bali selama satu siklus estrus. Indonesia Medicus Veterinus 1(3):330336. 7. Budiyanto, A. (2012). Peningkatan tingkat kebuntingan dan kelahiran sapi di Indonesia dan masalah-masalah yang terkait. Seminar Updating Penyakit Gangguan Reproduksi dan Penanganannya pada Ruminansia Besar. Perhimpunan Dokter Hewan Indonesia cabang Daerah IstimewaYogyakarta, Indonesia. 8 Maret 2012. 8. Chung, H.J., K.W. Kim, D. W. Han, H.C. Lee, B.C. Yang, H.K.Chung, M.R. Shim, M.S. Choi, E.B. Jo, Y.M. Jo, M.Y. Oh, S. J. Jo, S.K. Hong, J.K. Park and W.K. Chang. 2012. 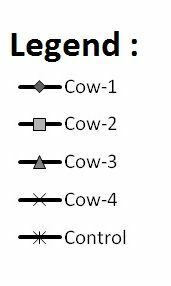 Protein profile in corpus luteum during pregnancy in korean native cows. Asian-Aust. J. Anim. Sci. 25(11):1540. 9. Darmadja, G.N.D. (1980). Half a Century Traditional Cattle Husbandry Within Agricultural Ecosystem of Bali. Ph.D. Thesis, Pajajaran University. Bandung. Indonesia. 11. Entwistle, K. (2001). Bali cattle performance – current population dynamics and performance and some strategies for improvement – preliminary report. In: Proceedings of the 2001 Seminar Nasional Teknologi Peternakan dan Veteriner. Bogor. Indonesia. 12. Hafez, E.S.E. and B. Hafez. (2000). Reproduction in Farm Animal. Seventh Edition. Lippincott Williams. USA. 15. Jimenez, F., C.S. Galina, B. Ramirez, and R. Navarro-Fierro. (1985). Comparative study of the concentrations of peripheral progesterone before and after PG2alpha injection between Bos Taurus (Brown Swiss) and Bos indicus (Indo Brazil) in the tropics. Anim. Repro. Sci. 9:333-339. 19. Parish, J.A. (2010). The Estrous Cycle of Cattle. Mississippi State University Extension Service. 22. Ricoy, E.F., C. Acua, R.M. Rincon, D.F. Cortes, R. B. Velenzuela and C.F. Arechiga. (2000). True estrus determination through evaluation of serum progesterone level at the time of insemination of dairy cows from semi-intensive dairies in north-central Mexico. Journal Animal Science. 79(Supll. I):227(Abstr.). 23. Romano, J.E. (2011). Pregnancy diagnosis in cattle. Veterinary population medicine. College of Veterinary Medicine, University of Minnesota. 24. Tagama, T. R. (1995). Pengaruh hormon estrogen, progesteron dan prostaglandin F2 Alfa terhadap aktivitas birahi sapi PO dara. Jurnal Ilmiah Penelitian Ternak Grati. 4(1):7-11. 25. Toelihere. M.R. (1985). Ilmu Kebidanan pada ternak Sapi dan Kerbau. Universitas Indonesia Press. Jakarta. 26. Wirdahayati, R.B. (1994). Reproductive Characteristics and Productivity of Bali and Ongole Cattle in Nusa Tenggara, Indonesia. Ph.D. Thesis, University of Queensland, Brisbane, Queensland, Australia. 27. Wiryosuhanto, S. (1996). Bali Cattle - their economic importance in Indonesia. ACIAR proceeding No. 75 pp. 34. Astiti, Luh Gde Sri, and Tanda Panjaitan. “Serum Progesterone Concentration in Bali Cow During Pregnancy.” Open Science Repository Veterinary Medicine Online.open-access (2013): e70081943. Web. 16 Mar. 2013. Astiti, Luh Gde Sri, and Tanda Panjaitan. “Serum Progesterone Concentration in Bali Cow During Pregnancy.” Open Science Repository Veterinary Medicine Online, no. open-access (March 15, 2013): e70081943. http://www.open-science-repository.com/serum-progesterone-concentration-in-bali-cow-during-pregnancy.html. Astiti, L.G.S. & Panjaitan, T., 2013. Serum Progesterone Concentration in Bali Cow During Pregnancy. Open Science Repository Veterinary Medicine, Online(open-access), p.e70081943. Available at: http://www.open-science-repository.com/serum-progesterone-concentration-in-bali-cow-during-pregnancy.html. 1. L. G. S. Astiti, T. Panjaitan, Serum Progesterone Concentration in Bali Cow During Pregnancy, Open Science Repository Veterinary Medicine Online, e70081943 (2013). 1. Astiti, L. G. S. & Panjaitan, T. Serum Progesterone Concentration in Bali Cow During Pregnancy. Open Science Repository Veterinary Medicine Online, e70081943 (2013). Research registered in the DOI resolution system as: 10.7392/Veterinary.70081943.